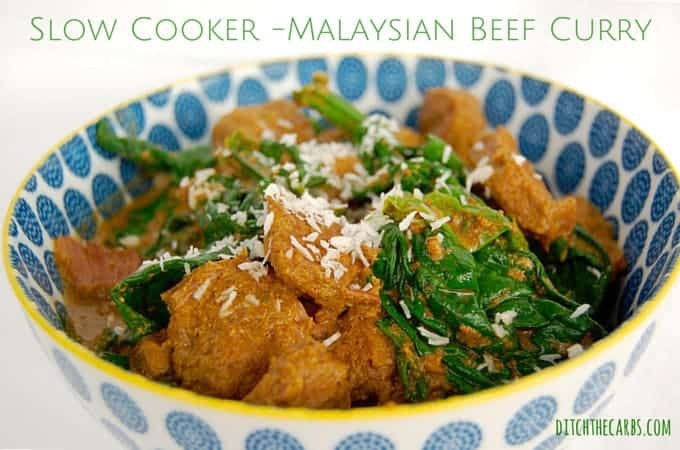 Slow Cooker Malaysian Beef Curry - low carb and nutritious. Slow cooker Malaysian beef curry is the perfect mid winter meal. Put it on in the morning and it is cooked when you come home. I love using the slow cooker. Put it on in the morning, and it is ready for you when you get home. It is also a really great way to economise by buying the cheaper cuts of meat, making extra and saving the leftovers for lunch the next day or freezing for another night. I serve the Slow Cooker Malaysian Beef Curry with Cauliflower Rice, flavoured with coconut and coriander/cilantro. Just grate the cauliflower in the morning and leave it in the saucepan ready to go. When you get home, throw the coconut cream in the pan, turn on the heat and it will be ready in 10 minutes! Add some leafy greens such as spinach, silverbeet, Swiss chard or kale to add even more nutrition and colour. Add the greens just before serving and cook for only 1-2 minutes. They will be wilted, but remain their vibrant green colour. Sprinkle some desiccated coconut, or coconut cream to garnish. Slow cooker Malaysian beef curry is best served with coconut cauliflower rice for the complete low carb curry meal. Put the coconut cream and all the spices into the slow cooker, mix. Add the chopped onion and chopped beef, mix. Cook on LOW for 8 - 10 hours or HIGH for 4-6 hours, depending on your slow cooker settings and recommended times. Add the leafy greens to the slow cooker 5 minutes before serving. Fold them through gently. Hi. I made this today. Lovely fragrance and tender meat but found it bland. Shows how much we are used to having salt in our food so will add a bit next time. Ok, it’s not the most attractive dish – darker brown than golden – but, once I added salt, it was absolutely delicious. I found the coconut cream curdled within half an hour of my turning the slow cooker on. Low 8 hours. But it was only an issue because of the excess liquid that had accumulated after several hours of cooking. So after adding a good amount of salt (cuts through the greasiness of meat fat and coconut cream), I turned the SC to High and left the lid off, so that the excess liquid could evaporate. Did the trick, the dish look so much better. Still not as pretty as a Thai dish, but absolutely delicious, and the meat was super tender. Would definitely make it again. The colour was also a dark-ish brown rather than the bright orangey brown pictured. Recipe requires some tinkering. Flavour was bland. I had to add a lot of salt. As well, the texture was of the sauce was not very smooth, but grainy. I did cook the recipe at a high setting for 5 hours which make explain the texture, but it was very odd. I also found the onion slices to be too large when cut quartered. They did not look appetizing and the bites were uneven because of it. After some fidgeting, the flavour turned out good but I was still a bit disappointed nonetheless. This is a great recipe! I made it for the second time today in the Instant Pot but added a little lemongrass & kaffir lime leaves. Mmmm. I used 1/2 can of coconut cream and it did turn out a little watery but I just added coconut flour until it was the thickness I desired. Hi Libby, thanks for your great recipes and advice. I am just starting out on a keto diet and tried your malasian beef curry, however I didn’t have time to do it in the slow cooker. So I cooked it in the pressure cooker instead. I think the pressure cooker might weaken the flavour a bit, so I added some extra spices at the end, but otherwise it was great. I was a bit sceptical of how the cauliflower rice would taste, but it was much better than expected and went really well with the curry. Fabulous! I have made this in the Instant Pot, and it turned out great, but with all curries, we will all be on different ends of the spicy scale. 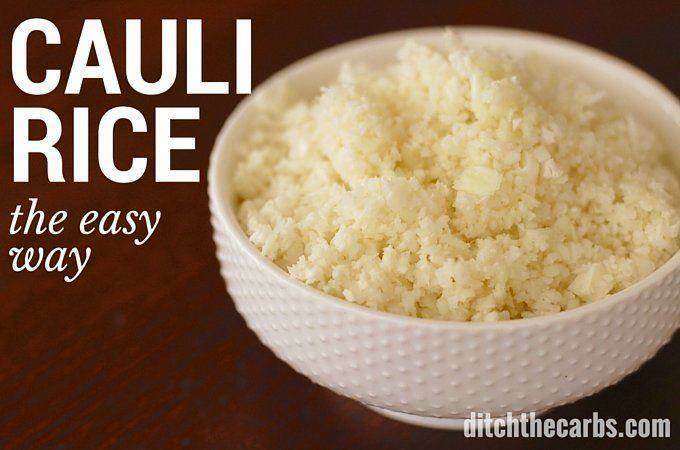 I’m so glad you enjoyed the cauliflower rice too, it’s a game changer! How long in the pressure cooker Libby? I would estimate 25 minutes. Yuck! This was a huge disappointment! Wow, my apologies it wasn’t to your liking. I’m not quite sure what there isn’t to like about it – meat, curry spices, leafy greens and coconut cream. Simplicity at it’s best. Goodness. i think you could have expressed your disappointment without being so rude. I made this with beef mince today. I added garlic and ginger as extras. This is a very nice flavourful recipe. I will definitely be using chicken or beef next time. Thanks Libby. I made this yesterday and it was the best dish i ever made. My family devoured it. It turned out so great I am making it a second time today! What a shame. It sounds like all the ingredients you used were correct, as you correctly witnessed, there isn’t much of a curry sauce to begin with. That usually develops as it slowly cooks and the fat renders out. Was the cut of meat you used extremely fatty? Sometimes the meat itself can have a high water content, especially if it had been frozen previously. The meat is the only ingredient where there could have been hidden moisture. To thicken a watery curry sauce, I often add some desiccated/shredded coconut or a little coconut flour dissolved in a little of the curry sauce. Either one will help thicken the sauce and add a little extra coconut flavour too. Has anyone tried this in a pressure cooker? Can I substitute Coconut milk for Coconut Cream? I find coconut cream way too rich for my taste. Hi just wondering what leafy greens you used please. I generally use chopped spinach or silverbeet (I think others may call it Swiss chard – whichever is in season and is cheaper at the time. This curry was so super easy to make, going to adjust and add more flavoring ingredients next time around. Took me about 15 mins to prep, then just set the slow cooker and wait until dinner time 🙂 Also added extra leafy greens in mine. Please don’t sprinkle the white grated coconut or dessicated coconut on top – that’s not Malaysian style at all. What we do is brown 1-2 tablespoons of coconut in a dry pan, pound it with mortar and pestle or mill it, then add it to the curry in its last five minutes of cooking. It gives it a lovely toasted coconut aroma. Thanks for helping to make it authentic! I want to make this for a Malaysian friend of mine, so this is great! Is the coconut cream the only liquid? And is it 1 cup or 1 can? Yes that’s the only liquid, you’ll be amazed at how much liquid and juices comes out from the meat as it cooks. It is so incredibly tender. For a special aromatic flavour, dry fry a tablespoon of dessicated coconut in a small pan till medium brown. Let it cool, then mill it in a blender briefly. Add it to the curry at the end. Also, throw in two crushed lemongrass stems, a couple of de-seeded dried red chillies, chopped garlic and grated ginger at the beginning for extra flavour. This would be closer to the Malaysian beef Rendang. If I double the ingredients – double the cooking time? No, but please check the instructions that come with your own brand of slow cooker. They vary considerably. You may have to cook it for a little longer but not double. Absolutely, that would be great. I just love turning my slow cooker on and forgetting about it. I would suggest cooking for an hour on a low/med heat. Stirring occasionally to ensure it doesn’t stick on the bottom of the pan. You could even put it in a casserole dish and bake it in the oven on a low/medium heat for at least an hour. The longer you cook it, the more tender the meat will be. I fancy making this recipe. However i just do not like cooked onions, would i be able to taste them in this? Or can i not use them? Yes you can taste them but feel free to omit them if you want a milder flavour and no onions. You can add garlic and grated ginger instead, if you prefer. This was the best curry sauce I have ever had, thank you! My husband said he would prefer it with chicken, but the beef was delicious also. Brilliant Leah. And yes you can pretty much substitute most meats in this recipe. I love my slow cooker, and making such amazing tasty dishes with pretty much zero effort. If I don’t have whole cloves can I substitute with clove powder? If so, how much? Yes but use only a quarter of a teaspoon. The fresh cloves really just infuse the clove flavour so dried cloves would be an instant punch of flavour. I can’t see where the recipe asks for cloves?? Hey thanks, for some reason the last spice had dropped off. I’ve popped it back in. 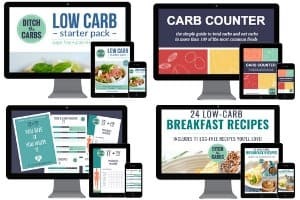 Hi, I jave been following a LCHF approach for a while now and came across your website while looking for new inspiration for meals. Your recipes look great. I just wanted to know does the nutrition information for this curry and your other curries include the cauliflower rice? For this one the nutrition is just the curry. I am slowly going through all my old posts and updating my nutrition panels making it clearer as to what it includes. Hi, I’ve always pre-cooked/warmed food if I’m going to slow cook, is this not the case with this dish? Awesome questions Rachel. I used to brown any meat before putting it into the slow cooker and I have now made it super simple and throw the meat and onions etc in raw. It cooks brilliantly and there is not enough of a difference to warrant me getting up early to fry meat before breakfast. By doing it this way I can rely on the slow cooker regularly because of the convenience. I use it to make life easier and be able to make a nutritious dinner when I don’t get in the door until after 6pm with hungry children after sports. Coconut cream is not the same as coconut milk. Coconut cream is 25% fat and comes out incredibly thick (you can even scoop the top off and whip for desserts). This is the Coconut Cream that I keep regularly in my pantry. The one I linked to looks expensive, I find one in the supermarket in litre boxes. And lastly, yes sometimes it does curdle but it has always just mixed back in, or add some more coconut cream at the end. Libby. Do you have any other malay recipes. I’ve recently visited malaysia and tasted beef rendang and onion sambala. do you have any idea how they’re made? Just add toasted, milled dessicated coconut – dry fry a tablespoon of it in a small pan till medium brown, then mill it and add it to the curry at the end. To get more of the rendang flavour, add a couple of stalks of crushed lemongrass. Add grated ginger too, if you like. Good luck! As for Malaysian recipes, google the names of dishes you like and you’ll find them. Adapt them to LCHF as needed. To your Beef Rendang, do add a few hand-torn Kaffirlime leaves in the last 5 minutes of cooking – they add that zesty aroma to a curry. 🙂 Happy cooking. Thank you Rachael. I am so glad when I hear people love my recipes and find my site helpful. That is exactly why I started it, helping families make real food, real easy. Libby. How much is “1c coconut cream”? Is that one cup or one can? Is there a specific amount in ml? Thanks. Is the coconut cream meant to remain intact? I’ve just checked mine and it’s split. Is there anyway to pull it back? Yes it should, but if it does split, make a paste of coconut flour and water then add that to thicken the sauce again. Could you substitute chicken in this recipe? Absolutely, that would be a great idea. I generally work our carbs per serving size as I don’t weight the final product which you would need to calculate per 100g. I use MyFitnessPal, but make sure you choose the correct brand you are cooking with otherwise different brands vary so much. I don’t have a slow cooker – if I did this in the oven what setting would I do it on and for how long? I would cook it at 160C for 2 hours. A clove is a spice. it is the flower bud of a tree. Click here to see. 4 cloves??? I can’t see any mention in the recipe?? Holy smokes I made this last night and it was UNBELIEVABLE. Thank you thank you. I added some homemade beef bone broth as my bit of beef was bigger and it worked really nicely. I also added some arrowroot (1 tbsp) to thicken it a bit at the end. AMAZING. Thank you SO much. I am not familiar with Chinese 5 Spice. Can you tell me what may be similar? Great looking recipe and I’d love to try it. It contains fennel, star anise, cassia, ginger and cloves. You can buy it at Sainsburys. Instead of using all the ground spices, you can use a tablespoon or two of curry powder, depending on how spicy you want it. That way, you need not buy so many individual ground spices.